Cut-off CRS score of 446 is 22 points lower than first Express Entry draw of 2017. 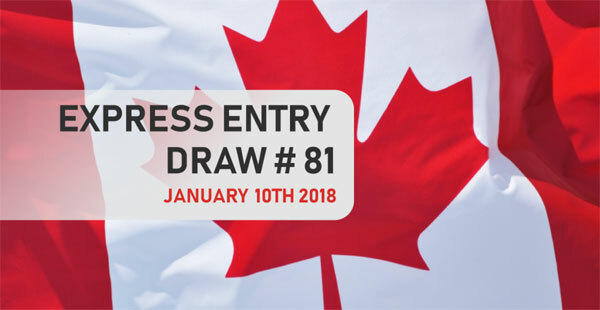 Canada has invited 2,750 Express Entry candidates to apply for Canadian permanent residence in a draw that took place January 10, 2018. The cut-off Comprehensive Ranking System (CRS) score for this draw was 446. Today’s score of 446 is the same cut-off CRS score as the previous draw that took place on December 20. It represents the lowest CRS cut-off for a first draw of the year since the Express Entry system came into effect in January 2015. Immigration, Refugees and Citizenship Canada (IRCC) again made use of the tie-break rule in this draw. The tie-break time and date was November 18, 2017, at 6:30:42 UTC. The draw was the first of what is expected to be a busy opening half of 2018 for Canada’s Express Entry system. That same period in 2017 saw 16 draws and CRS cut-off scores that dropped from 468 in the first draw of the year all the way down to an unprecedented 413 in May. Given Canada’s larger Express Entry targets for 2018 — not to mention its expanded Family Class and Provincial Nominee Program targets — it’s expected to be a busy year for Canadian immigration. In the three Express Entry economic immigration categories alone, Canada has increased its target admissions by 3,200 over 2017, which saw a number of Express Entry records set. 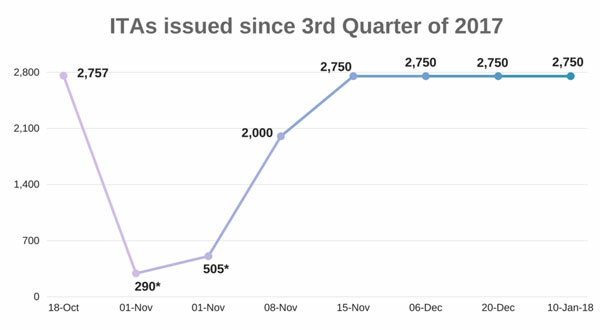 Not only did it post the lowest cut-off CRS scores to date, but the 2017 saw 30 draws take place and a record total of 86,023 Invitations to Apply (ITAs) issued. That number represents 56 per cent of the 153,618 ITAs issued since Canada’s Express Entry system came into effect in January 2015. With IRCC’s higher ITA targets for 2018, it’s expected that this will translate into larger or more frequent draws from Express Entry pool in the coming year, or possibly even both. That could mean even lower cut-off CRS scores in the weeks and months to come. Anika and Arjun are married. They are both 30 years old with bachelor’s degrees and are working as web programmers. They have also each written the IELTS and scored an 8 in each category. While neither Anika or Arjun have worked or studied in Canada, Anika has a brother who is a permanent resident residing in the Canadian province of Ontario. Their CRS scores of 450 would have been sufficient to obtain an ITA during the most recent draw. Haider is 32 years old and has been working as an accountant for three years. He has an Initial Advanced English language proficiency and has completed a bachelor’s degree as well as an additional one-year post-secondary certificate. Though Haider has never worked or studied in Canada, his CRS score of 446 would have been sufficient to obtain an ITA in the January 10 draw. “The previous year started with a CRS cut-off score of 468 and scores went down to a record low of 413 at one point. This year is starting nearly 22 points lower than that first draw of 2017, which could mean even lower CRS records in 2018,” said Attorney David Cohen, senior partner with the Canadian immigration law firm Campbell, Cohen. Find out if you are eligible for Canadian Immigration by filling out our FREE online assessment form.